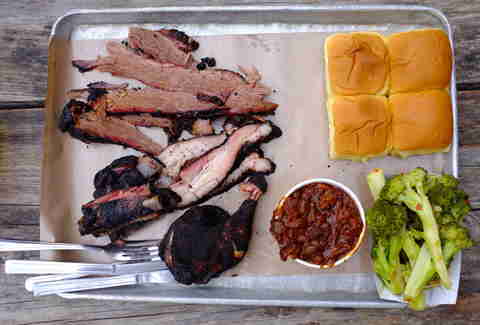 While barbecue will likely forever be associated with the American South, in recent years, New York’s barbecue cachet has risen, like, a lot -- so much so that Texas Monthly Barbecue Editor Daniel Vaughn once said brisket at Williamsburg's Delaney Barbecue “could hold its own against some of the best in Texas.” Turns out, it can also hold its own against some of the best in NYC, aka these 10 places, which we've laid out along with a go-to order at each. It’s gonna be a meaty spring. Mighty Quinn’s boasted the longest lines at the first-ever Smorgasburg in 2011, and if you’ve ever tasted its brisket, it’s easy to see why. The 22 hours each brisket spends in the smoker yields a perfectly smoky, beefy, and sweet...y product that makes adding sauce basically irrelevant. But, while the beef is undoubtedly the star, Mighty Qunn's pulled pork is juicier and far tastier than most of its local rivals (the sides are also top-notch -- try the sweet potato casserole). Pitmaster Hugh Mangum was educated at the International Culinary Institute (awesomely, he also played drums for obscure '90s rock band Maypole), but credits his barbecue expertise to his Houston-native father and North Carolina-bred wife. One of the oldest barbecue joints in the Northeast, Dinosaur began life as a mobile concession stand upstate in the '80s. Owner John Stage opened the first permanent restaurant in Syracuse in 1988, eventually expanding to Harlem in 2004 and Brooklyn in 2013. Pig is your best bet at Dinosaur: the pulled pork is beyond solid, but the real standouts are the St. Louis-style spare ribs, smoked in a slightly spicy and seemingly magical dry rub, and then glazed with Dinosaur’s own barbecue sauce. 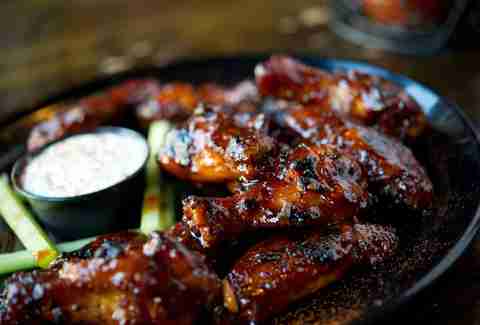 The wings are also outstanding, mostly because they feature the same rub. 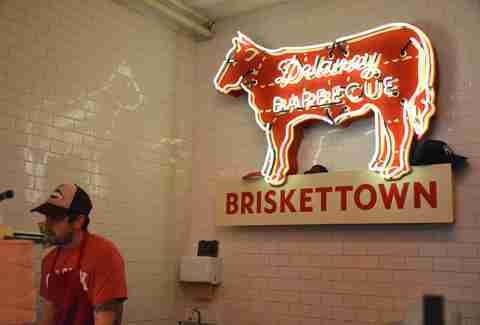 BrisketTown, Delaney Barbecue’s flagship, is considered by many to be the gold standard for barbecue brisket in New York. Pitmaster Dan Delaney moved to Texas in 2008 to learn the art of smoking brisket, then brought it North for a series of “Brisketlabs”, before eventually opening in Williamsburg in 2012. As the name would suggest, the salt-and-pepper rubbed brisket is, without question, the thing to get at BrisketTown, but the hot link beef sausage is also outstanding. Delaney is also generous enough to offer free birthday meat. 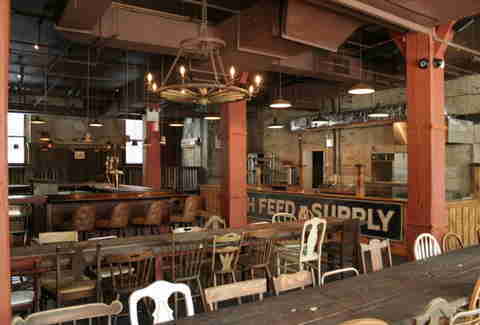 Thanks to Hurricane Sandy, Hometown Bar-B-Que almost ended before it even really got started, but after nearly a year of rebuilding, Red Hook’s own Texas 'cue joint opened in September 2013. 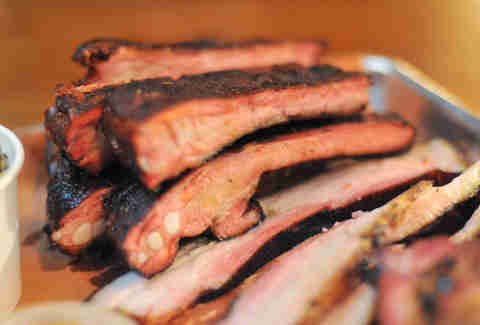 Since then, it's specialized in serving massive beef ribs, each one well-spiced, intensely meaty, and perfectly tender. The brisket is also fantastic, while the menu gets some idiosyncratically fast touches with things like pulled lamb belly and pastrami... bacon? Yep, pastrami bacon. Named for the abolitionist whose portrait adorns the walls, this Queens joint offers New York’s best Kansas City barbecue. 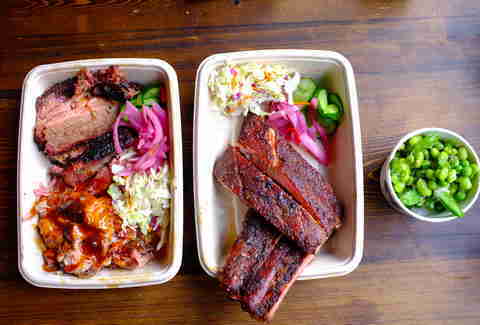 The pulled pork, spare ribs, and sides are all great, but the burnt ends -- essentially cubes of extra-fatty brisket tips which have been smoked for a longer time -- are out of this world, each one bursting with sweet, fatty smoke. In a landscape dominated by Texas-style barbecue, Arrogant Swine is steadfast in its focus on North Carolina. 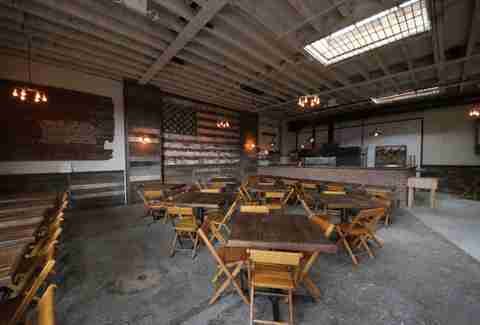 Pitmaster Tyson Ho originally ran Arrogant Swine as a summer pop-up around Brooklyn before opening a permanent location in Bushwick. The key meats are the East Carolina Whole Hog -- traditional pulled pork featuring the standard shoulder and white meat -- and the Western NC pork shoulder, perfectly smoked and cut into chunks. The pork sausage rings are also a menu standout, as is the beer selection, and the waffle-pressed mac & cheese -- one of New York’s most fun BBQ sides. 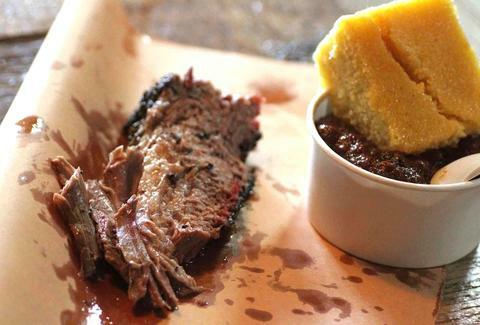 Hill Country is the closest thing New York has to a central Texas barbecue market: the massive space features several counters, each devoted to meats and sides, which are served on butcher paper. Like any good Texas 'cue joint, the beef is the thing to get, and the brisket (we’re partial to the fatty) here doesn’t disappoint. Other nice touches include a comprehensive sides menu (excellent mac & cheese, German potatoes, and green been casserole), a selection of Shiner beers on tap, Texas specialties like Big Red soda and Blue Bell ice cream, and Kreuz sausage “imported” from Lockhart, TX. Opened in 2011 by husband-wife duo Jeff Lutonsky and Meghan Love, Mable’s is probably Williamsburg’s most unsung barbecue joint. The couple built the place with an eye towards no-frills Southern roadside hospitality (Lutonsky hails from Oklahoma, Love is a Kentucky native), and they succeed spectacularly. All of that would be meaningless if the food wasn't also delicious, as it is with the tasty, meaty brisket and the andouille sausage, which boasts that perfect snap and savory cajun spice. Fette Sau’s location in a former auto body repair shop may lend itself to a traditional-looking New York-goes-South vibe, but the menu is more experimental than most of its rivals. All of the meats are smoked with a house-made dry rub featuring coffee, which works best with fatty pork belly and juicy brisket. 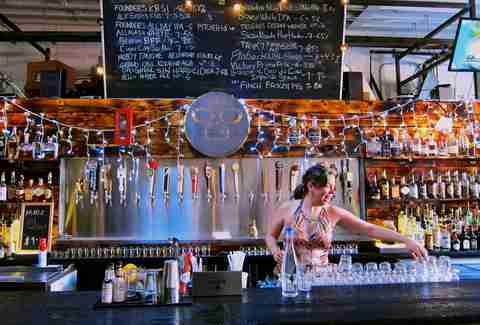 Fette Sau also takes pride in its beer and whiskey lists, each among the best in the city. 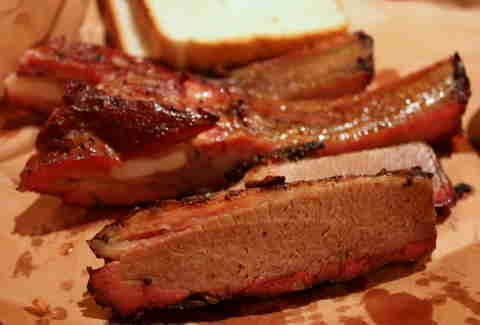 Fletcher’s has some of New York’s more diverse barbecue offerings. 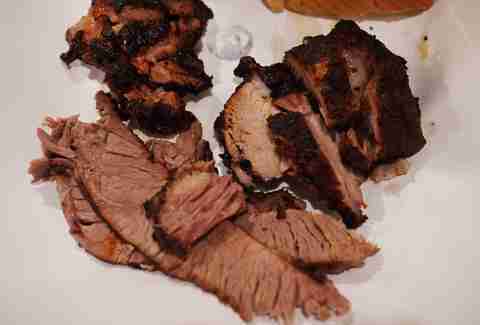 In addition to the usual suspects -- brisket, burnt ends, St. Louis-style spareribs, pulled pork -- Fletcher’s offers a rotating list of special meats which range from uncommon regional specialties (Kentucky lamb ribs) to the outright unusual (barbecue char-siu pork). It’s a solid option if you’re looking for straight-up BBQ, but it really shines if you’re in the mood for something a bit more unusual. Ben Jay is a photographer, journalist, carnivore, beer and whisky drinker, and music nerd, and his hobbies include brisket and Liverpool FC. You can find his work at Gothamist, Serious Eats, Edible Brooklyn, Edible Manhattan, and the Village Voice, or follow him on Twitter and Instagram.